Prototype: German Federal Railroad (DB) class 78 fast passenger locomotive. Version before 1955 with dual headlights. Model: The locomotive comes with an mfx decoder and controlled high-efficiency propulsion. 3 axles powered. Traction tires. The headlights will work in conventional operation and can be controlled digitally. 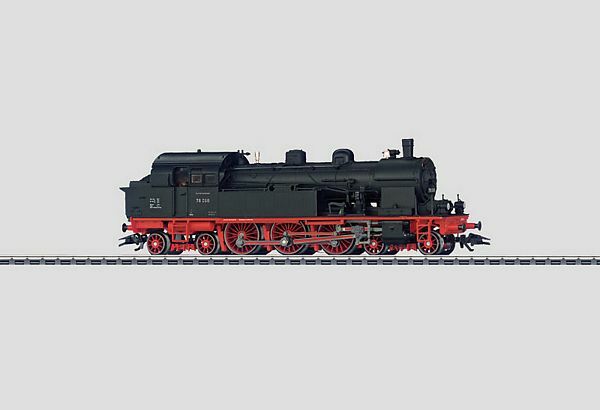 The locomotive has numerous separately applied details. Length over the buffers 16.9 cm / 6-5/8. 78 to 74. The fast class T 18 tank locomotives from Prussia, Wurttemberg, and Saarland made up the class 78.0 on the German State Railroad. Over 80% of this roster, or 424 units, came to the German Federal Railroad. They were used primarily in regional service with and starting in 1953 they were ideal motive power for passenger trains with the new three-axle rebuild cars, which were authorized for speeds up to 90 km/h / 56 mph. These partnerships were maintained in some cases for almost 20 years. After that, the class 78 locomotives were gathered in the Stuttgart District and were retired one by one until 1974. The rebuild car pairs, item nos. 43172, 43182, and 43192, form the passenger train for the class 78 model.